I remember once on the original eTatters having a bunch (ok three or four) people taking issue with me knowing how many double knots were in the project I was working on. There were also some people that thought it was a good idea, especially if you are a teacher or a seller. In Mary Konior’s Network I came up with something like 7614 double stitches. Of course all the rings have the same number of stitches and all the chains are the same length or half that. So it was easy math, especially since I had to keep track of where I was to know when to insert the rings within the mesh. This is the piece I did in 2006 when I published the ds count. Today’s math was easier, but we will get to that in a minute. Since it is hard for me to pull out my pillow when the kids are home, but I had some time I decided to get ahead on my prickings. 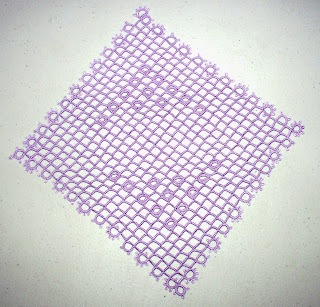 I am on lesson 2a in Barbara M. Underwood’s Introducing Traditional Bedfordshire Lace in 20 Lessons. I already have the pricking for lesson 2b created and punched so on to Lesson 3. What most people may not realize is that I must agree with Alexandra Stillwell, “The most important factor in an attempt to achieve good lace is to use an accurate pricking, and to draft it oneself is the answer,” from Drafting Torchon Lace Patterns. I do hope to acquire this book someday. 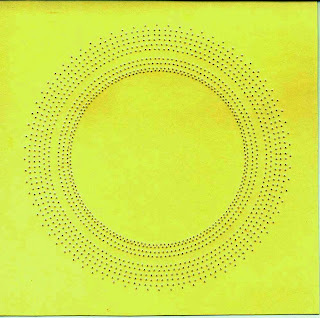 Lesson 3 in Introducing Traditional Bedfordshire Lace in 20 Lessons is a circle requiring 18 pairs of bobbins. At first I decided to just copy the pricking from the book and I got as far as printing it on a piece of a Manila File Folder and covering it with plastic. Then before I started punching pinholes I decided it was just too uneven for my technocratic self. So I drew it using DrawPlus X2. Now the first thing you need to know is how many repeating patterns. In this case 72 so every 5°, so a few concentric circles a few lines all drawn over a scan of the original. Some simple rotating of copies and voilà you have a pricking. So print, cover and punch. Punching pin holes can be very relaxing, but I might have done too much. My right hand is a bit sore. But if each repetition has nineteen pin holes, 72 of them will have 1368. Here is a photographically enhanced view of the back. Thanks for stopping by. Hopefully I will tell you about Christmas soon. Beautiful piece. I especially love the color. Wish I had your patience with patterns and prickings. I'm too anxious to get started. Hope you will post more frequently. Your netted piece is perfection. Good luck with the bobbin lace, the book sounds good. If only days were longer!